Butterflies bring a sense of joy and wonder as they gracefully flutter about pollinating our garden plants. Unfortunately, their populations are in decline due to loss of habitat and migratory corridors, pollution and pesticides. But, there are simple things we can do to help them. For starters, it’s important to provide butterflies with the proper place to lay their eggs. Females are very specific when it comes to this. They only lay their eggs on the underside of leaves of specific native plants, upon which their offspring will feed as caterpillars. [Butterflies have a 4-stage life cycle called metamorphosis: egg, larva (caterpillar), pupa (chrysalis) and adult]. Native plants that provide both nectar-producing flowers for adult butterflies to feed upon, and larval host plants where females lay their eggs and their offspring feed upon. 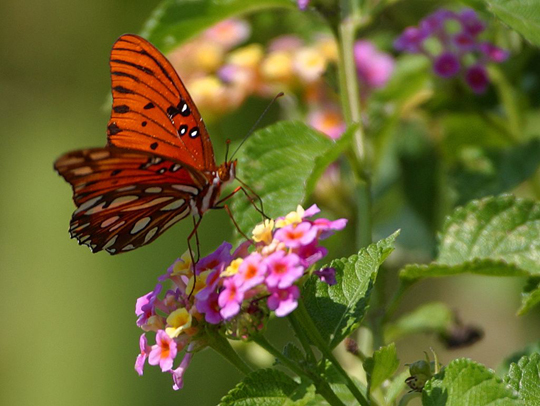 Brightly colored flowers that that bloom in clusters or single blooms that provide a good landing pad for butterflies. Include a variety of plants with staggered bloom times. A quiet garden that offers protection from strong winds (perhaps with a hedge, stone wall or fence to block winds). A sunny spot for butterflies to soak up the sun. Flat rocks warmed in the sun work well. Be sure to place some where they will receive morning sun so basking butterflies can warm up their muscles after a cool night and be able to fly. Sand-filled shallow puddles for thirsty butterflies to drink from. [Be sure to refresh the water after a few days to avoid mosquitoes from breeding]. Asters, black-eyed Susans, blue false indigo, clover, lupine, native milkweeds (especially important for migrating Monarchs), sedum, violets, turtlehead, dill, parsley, fennel, rue, Queen Anne’s Lace, hollyhock, hibiscus, helenium, pearly everlasting, snapdragon, Dutchman’s pipe, ‘Silver Brocade’ Artemesia, spotted geranium (Geranium maculatum), salvia, coreopsis, Rose of Sharon, nettle, false nettle and plants in the mint family. Trees and shrubs to include: White ash, plantain, spicebush, sassafras, citrus trees, prickly ash, Aspen, birch, cherry, hackberry, oak, elm, poplar, wild cherry, viburnum and willow. Need help designing your garden? Pennsylvania residents can check out a garden template from IConservePA.org. There are many other resources, from online sources to those found in the library or bookstore. Of course, professional landscape architects and designers offer expert services as well. Another simple way to help butterflies, specifically the Monarch butterfly, is to buy only organic, non-GMO corn and soy products. Most corn and soy is now grown using pesticides that kill milkweed, the only plant that Monarchs lay their eggs on. Thanks for one’s marvelous posting! I genuinely enjoyed reading it, you could be a great author. I will be sure to bookmark your blog and definitely will come back later on. I want to encourage you to continue your great posts, have a nice day!